Tender chicken and pasta in a creamy sauce covered with crunchy bites of stuffing. It doesn’t get any more comforting than that! 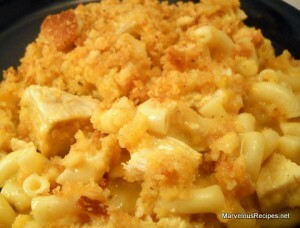 In an ungreased 13×9-inch baking dish, combine the cubed chicken, cooked macaroni, cheddar cheese, chicken broth, cream of chicken soup, minced onion and curry powder. Stir until well blended. Toss the stuffing mix with the melted butter; sprinkle over the chicken mixture. Bake, uncovered, at 350 degrees F for 20 minutes or until bubbly and topping is lightly browned. Makes 8 servings. My family liked it so much we didn’t even have any leftovers! Thanks for visiting. I am actually going to try this tonight for dinner. I already went to the store and bought the ingredients to make it. Wish me luck. Looks yummy! !